Russian booth is always brightly decorated with traditional Russian shawls and colorful crafts. It is full of games, music and fun! Come try your attention and agility skills at some Russian movement games such as Spoons, Pillow Fight, Reins and others. You can race a friend at Blind Matreshka Assembly Race or learn some letters of the Cyrillic alphabet in the memory game. This year we will also be serving traditional Russian blini pancakes and tea! Come see pictures of Bolivian features that have broken records! Lake Titicaca is the world’s highest lake that’s deep enough for a boat to sail on. Salar de Uyuni, is the world’s largest salt flat. And the world’s highest forest sits more than 13,000 feet above sea level in Bolivia’s Sajama National Park. Have fun making your own llamas, play musical chairs with Bolivian music and win some prizes!!! Have you heard about Magellan, Gama (who discovered the sea route to India), or Cabral (who discovered Brazil)? How about Cristiano Ronaldo (one of the best soccer players in the world)? Did you know they were all born in Portugal? And did you know cork is the bark of a tree that grows in the south of Portugal? Come to our booth and discover with us! Come, see and discover! Match India's rhythms to your heart, its color to your mind and find an experience that is your own. India offers a different aspect of her personality – exotic, extravagant, elegant, eclectic – to each visitor. Get your hand painted with Henna. 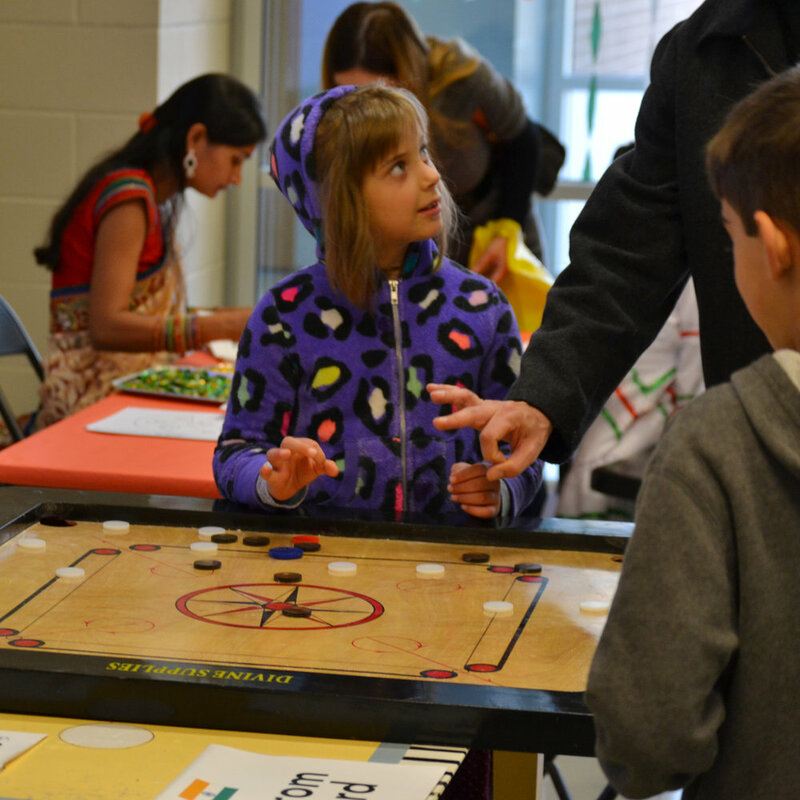 Play the fun game of "Carrom" with your friends. India and Yoga go hand in hand. Have fun playing yoga game and learning some kids yoga poses. Make a Yoga figure for yourself in the craft. Enjoy a yoga demo during the entertainment lineup in cafeteria. Relax, Refresh, Restore and Rejuvenate with yoga. Take home an experience that is truly incredible! Explore the Philippines, a nation made up of over 7,000 islands in the western Pacific Ocean. On display in our booth you will find beautiful textiles and artisanal jewelry handmade using time-honored methods, as well as books showcasing native food and traditional architecture. Learn how to play the game Sipaand write your name in Baybayin, the ancient script of the country. We are looking forward to greeting you "Mabuhay"! Come Visit us and learn about Colombia. The second most diverse country in the world and home of the famous Amazonian pink dolphins. Show us your yo-yo skills, try your luck playing the balero and guess how many canicas we have in a jar. Don't forget to bring your best salsa moves. Sri Lankan booth is decorated with traditional Sri Lankan art and crafts. It will display musical chair games, artwork, coloring activities, and more!!! At the China and Taiwan booth, you will experience Chinese culture by doing the activities in the booth. In the booth, we will have 3 stations: “What is your Zodiac Sign?” “Chopsticks Master” and “Chinese Outfit Photo Booth.” At “What is your Zodiac Sign?” station, you can learn about your Chinese zodiac animal sign. At “Chopsticks?” station, you will learn how to use chopsticks and compete with someone with your new skill at the table. At “Photo Booth” station, you get to dress up with traditional Chinese clothes. There also will be posters displayed to show you the 3 most important Chinese holidays. The Costa Rica booth showcases several traditional artifacts and handicrafts. Come by our booth to make crafts, smell some commonly used spices, and learn about the Tico culture and its environmental leadership. You can learn different techniques for braiding bracelets and decorate your own Boruca mask! We can’t wait to see you! Bonjour! Come to the French booth to taste some French bread and cheese, test your Etch-A-Sketch and “Bilboquet” skills, and pick up a quick and easy French crêpe recipe! À bientôt (see you soon)!!!!! Come visit the Italian "Booth" where you can find several postcards from all over the most well known cities in Italy, traditional food and many original art works. We will teach you any Word you would like to learn and share culinary secret ... that only real Italian know! Come learn about Cuba! The largest island in the Caribbean, it’s known for its music. Favorite past times include baseball and playing dominoes. Come learn how to play “cubilete,” or try your hand at dominoes. Listen to the sounds of the island such as son, mambo, and Cuban reggaeton. Learn about famous Cubans. You may recognize some of them! Come visit us at Turkey booth and have the opportunity of learning about beautiful peninsula and its mesmerizing beaches, an amazing culture conveyer bridge in the middle of Asia and Europa. Come and learn about its thousands of years of history, a humorous Shadow puppetry “Karagoz- Hacivat”, a traditional Turkish game named “Tavla”, and experience some Turkish art work along with Roberts children called “Ebru”. Come one, come all!! Romania will be hosted for the first in classroom 218! Come see photos and videos of one of Europe’s exceptionally beautiful countries! Come talk with natives from Romania and learn about the culture and history! Maybe play a game or two while snacking on the country’s sweetest treasures! Come visit the Great White North and learn about Canada. Bundle up, watch out for snow and polar bears, and carry your hockey sticks! Located just above the United States, it is the world’s second largest country by land area, most of which is covered by forest and ice! Canada is home to ice fishing, ice hockey and skating, and the well-known Niagara Falls.